People have been climbing into the Pak Ou caves, high above the Mekong some 25km from Luang Prabang, for maybe a couple of thousand years. They were used for the worship of the river spirit until Buddhism spread into Laos along the southern route from India. And gradually, over the 60 decades, more than 4,000 Buddha images  mostly the standing Buddha of the Luang Prabang style  have been placed in them. There are two caves in a striking limestone cliff where the Nam Ou river meets the Mekong. The lower and smaller, called Tham Ting, is open to the light some 50ft above the river; but the higher cave, Tham Phum, is deep and impenetrably black without a torch. Most people get to the Pak Ou caves by river from Luang Prabang and make an easy landing at a little jetty under Tham Ting. But others brave the land route  though a new road is making it far easier for jumbo (open taxis) and passengers alike. The jumbo will take you to a small village on the opposite bank, a dozen or two wooden houses raised off the ground, a handful of watchful but friendly villagers. A brief walk takes you to the edge of the village ... with a view across the river that is worth the journey on its own. Below, local lads wait with their small boats to ferry Pak Ou pilgrims across to the caves, returning later to pick you up for the return journey. As you climb to Tham Ting, you realise that it is more a shrine than a cave: there is a place to kneel before the biggest Buddha images, maybe to light a candle or burn some incense. And there are walkways to get you closer to the accumulated images, some of which silhouette against the bright light of the Mekong, and the often-seen fortune-telling sticks  though you will need someone to read the prediction to you if you cannot understand Laotian. 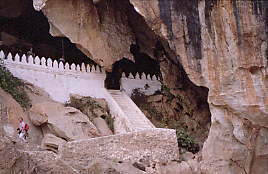 A path against the face of the cliff leads up to Tham Phum, and although the outside is nothing much in comparison with Tham Ting, the cave holds the vast majority of the 4,000 Buddha images. There, as you descend into the blackness, you will jostle with visitors from half a dozen countries but Laotians and Thais are likely to be in the majority. By the time you reach the part of the cave where the images are located, both in a main cavern and in passages off, the engulfing blackness defeats everything except a flashlight. You find yourself stumbling and staring briefly as a light or a camera flash illuminates the massed ranks of the images. Oddly, the smaller Tham Ting offers the most inspiring experience. Its Buddhist serenity, between the waves of tourist boats, blends into the naturalness of the Mekong, the grey Asian sky, the greenery on the far bank.